In almost everything that Fr. Noailles wrote or did, we find evidence of how his thoughts were constantly on the two Holy Families, that of Jesus, Mary and Joseph and that of the Association which he founded. The coat-of-arms which he designed around the mid 1830’s is no exception. In it we find reflected the structures of the Association and the qualities the various members are called to have. Count O’ Kelly, an Irishman living in France who had heard the story of the Miraculous Benediction, came to make further inquiries about it and met Mother Bonnat. Over a period of time he got to know the Association well. As a brother and friend of the Holy Family he became interested In everything about it. His desire to make it known and to spread it was almost as great as the Founder’s. During one of his visits to Mother Bonnat, Count O’Kelly asked about the Holy Family crest. When he was told that one had not yet been designed, he suggested that the Holy Family should adopt the shamrock, “the beloved and blessed plant of my green Erin”, the emblem of the three hearts of Jesus, Mary and Joseph and that it be surrounded by a triangle, the emblem of the Blessed Trinity. Some time afterwards, Mother Bonnat brought a shamrock to Fr. Noailles in Martillac and proposed that it be part of the ccrest. He agreed and, eventually, on one of his journeys to Paris, had an engraving of the shamrock made. 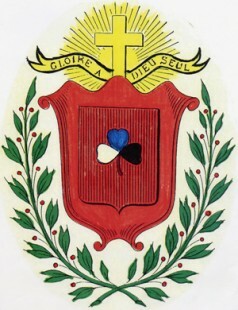 Then, with the help of Mother St. Charles Borromeo, he designed the complete crest with the shamrock as its centre-piece. Mother Bonnat describes the design and gives Fr. Noailles’s explanation of the various emblems and colours on it. On the crest the shamrock rests on a shield. Over this is a cross set in rays of the sun from which flows a banner inscribed with the words, ‘Glory to God alone’, the motto of the Association. The whole is surrounded by two olive branches. At that time the Association of the Holy Family was divided into four Societies. The Society of Jesus was for all clerics ranging from cardinals to seminarians. All the women, married, single and religious belonged to the Society of Mary. All the men who were not clerics were members of the Society of St. Joseph. The Society of God Alone comprised all the members of the Holy Family who had offered themselves unreservedly to Fr. Noailles to be at the service of the whole Association. The shamrock symbolises this structure. The three leaves of the shamrock represent the Societies of Jesus, Mary and Joseph; the stem represents the Society of God Alone which keeps the others united. The cross and the rays of the sun recall the Miraculous Benediction. The olive branches represent the Peace be with you from the gospel of the second Sunday of Easter, (Jn 20: 19-31) the day on which the feast of the Holy Family was celebrated in Bordeaux in the nineteenth century. The colour of the shield is red, a colour which signifies faith, constancy and purity. The colours of the shamrock are blue, white, black and purple. The leaf of the Society of Jesus is blue, signifying beauty, majesty and serenity; that of the Society of Mary is white, symbolising innocence, openness and loyalty; that of the Society of St. Joseph is black, meaning knowledge, modesty, work and suffering. The colour of the stem representing the Society of God Alone is purple which signifies dignity, power and sovereignty. Though the qualities of courage, constancy and patriotism are connected with the Irish shamrock, the humble plant is now called to an even more beautiful destiny because it will shine on the banner of the children of the Holy Family and be for them a sign of union and togetherness. It will not inspire acts of chivalry among us – we leave that glory to warriors – but devotedness and fidelity can be found anywhere and should be understood more nobly and practised more holily by the men and women who have left everything for God and who want to live only for God’s glory. May the shamrock be for us, even more than for the Irish, a constant reminder of what we owe to God almighty and to the adorable, holy and lovable persons of Jesus, Mary and Joseph. The shamrock, along with the other symbols on the crest, can provide us with plentiful material with which to deepen our reflection on the spirituality and mission of the Holy Family.